Make this luxurious apartment your new home! 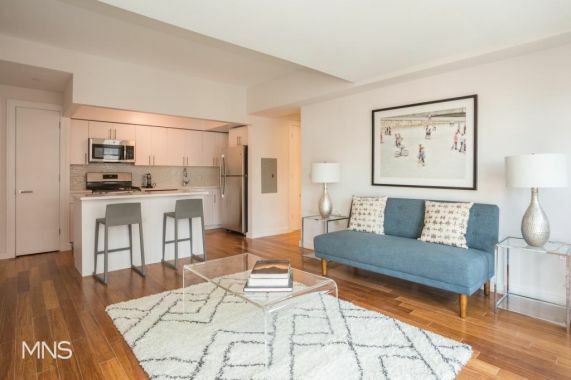 Featuring oversized, floor to ceiling windows, this spacious unit is flooded with natural sunlight. The gourmet, fully equipped kitchen is perfect for entertaining, with an open layout, stainless steel, GE appliances, and white Caesarstone countertops. For your convenience, all residences are equipped with GE Washer and Dryer. No need to worry about storage anymore, as all units have additional closet and cabinet space. 27 Albany comes with an endless list of facilities that will complement your urban lifestyle, and it is just a quick stroll from the A and C subway lines. Residents enjoy exclusive access to a fully equipped fitness center, a relaxing lounge and game room, and communal outdoor terraces with unobstructed skyline views. For your security and convenience, 27 Albany also has a Virtual Doorman and package room, so you don't miss a beat. To top it all off, the building offers onsite parking and is entirely smoke-free. **Photos are of actual unit staged for advertising purposes only.